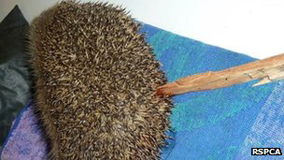 A hedgehog was stabbed with a stake in Wolverhampton. The creature was found on Wednesday in the grounds of The Coach House Care Home in Goldthorn Hill. A wooden pole had been pushed through him and he was so badly hurt he had to be put down by a vet. The RSPCA is appealing for information. RSPCA inspector Vicky Taylor said: "This was a really gruesome case and definitely deliberate. It was outright cruelty." The charity said the area the hedgehog was found in was inaccessible to care home residents but could have been entered by the public. Lee Stewart, RSPCA centre manager, said: "We always do all we can to save animals brought to us but sadly there was nothing we could do on this occasion, the stake had almost pierced through to the underside of the body. "This poor hedgehog must have suffered terribly." It is against the law to inflict unnecessary suffering on a wild mammal, with a maximum penalty of a £5,000 fine and six months imprisonment.